Kids grow up so fast! Before you know it, you’ll be planning another birthday party for your little one. 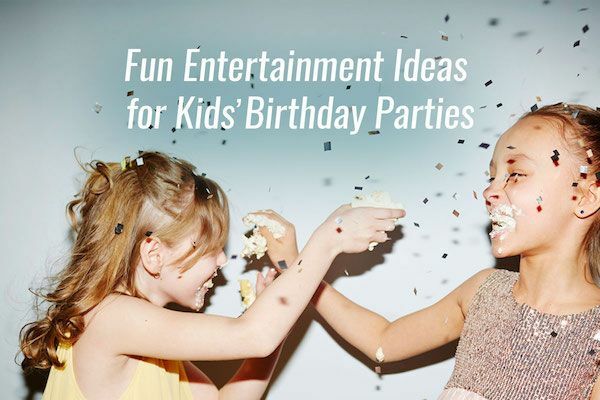 As experts in event entertainment, we wanted to pitch in a few ideas for kids’ birthday parties to help you plan the best one yet. Take a look below for some inspiration! Whether it’s at home or around the neighborhood (with parental supervision, of course), a scavenger hunt is a great way to build excitement and keep kids entertained. It especially goes hand-in-hand with a detective-theme party. To pull it off, split them off into groups to find the grand prize with clues scattered along the way. You can even gratify them with mini prizes to keep everyone happy—easy peasy! If you’re stumped on clues, check out these printables by Celebrate Every Day With Me for a scavenger hunt around the house. Kids just want to have fun and that often involves some amount of mess (you know it’s true). Why not turn that mess into something creative instead? Get the kids out of your home and into an art studio that offers painting activities that lets everyone create their own masterpiece. Splatter painting has been especially popular because it requires minimal effort and is tons of fun! Best of all, these paintings are the perfect party favors for kids’ birthdays and make for great birthday party entertainment. Kids have boundless imaginations, so let them express themselves by having a dessert decorating activity. Cupcakes or cookies are popular and easy choices as they can work with different colored icing and toppings. If you like the idea of personalized desserts but don’t like the idea of things getting too messy, opt for a dessert table that offers a variety of toppings instead. You or another adult can help put together the desserts which makes them personalized yet mess-free. Here’s a fun idea for an ice cream dessert table by Moms and Munchkins we love. But the ideas don’t stop there. Hot chocolate, s’mores, or waffle bars are some other ways to keep things playful! A photo booth rental is a great way to capture all the fun and memories from any occasion—especially for kids’ birthday parties! Opt for a rental that has interactive features such as a touch screen, green screen backgrounds, animated green screen backgrounds, animated GIFs, and digital props. These features will keep them entertained throughout the party, while the prints double as party favors which the kids and their parents will equally love. If it’s your first time renting one, here are a few more things to look for when renting a photo booth. We also have custom birthday party entertainment packages, so check your date for more information! While magic shows are perfect for birthday party entertainment, they’re also very common. If you’re looking to switch things up, hire entertainment that can also be educational in a fun way! Instead of hiring a magician to put on a show, look for someone who’ll teach kids how to perform the tricks themselves. If magic isn’t your thing, opt for someone who can show them how to have fun with chemistry and help them carry out safe experiments as part of the activity. Not only will the kids have a blast, they’ll also learn something new! These are just a few ideas for kids’ birthday parties to get you started. Remember, with a bit of creativity and a pinch of inspiration, you’ll be planning amazing birthday parties like a pro! Have more ideas? Share with us in the comments below.